One minute you’re a hero; the next minute you’re a zero. 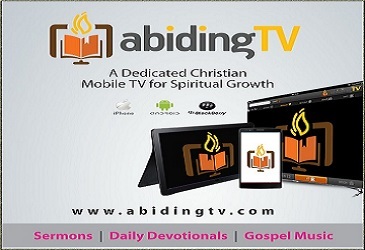 “I am not trying to do what I want, but only what [my Father] who sent me wants” (John 5:30 GNT). You can’t please everyone. It’s one of the great truths of life. If you haven’t learned it yet, you’ll struggle with stress for the rest of your life. If you please group A, group B will be upset at you. And if you please group B, you’ll upset group A. One minute you’re a hero; the next minute you’re a zero. Even God can’t please everyone. Think of all the sporting events where people on both sides pray for a win. Only one team can win the game. One person prays for rain. Another prays for snow. Only one gets their prayer answered. If God can’t please every person, it’s foolish for us to try. If you don’t know whose approval you’re living for, stress will always follow you. Jesus models this for us. I’ve been sharing with you Jesus’ seven principles of handling stress. Yesterday, I discussed the Principle of Identification. Next is the Principle of Motivation. You must know what (and more importantly, whose approval), you’re living for. Jesus showed us this in John 5:30 when he said: “I am not trying to do what I want, but only what [my Father] who sent me wants” (GNT). 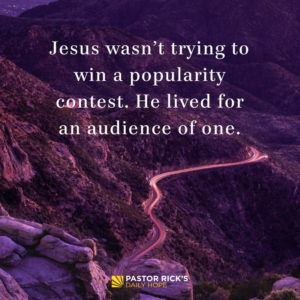 Jesus wasn’t trying to win a popularity contest. He lived for an audience of one. He had a simple life in many ways. He just did what God put him on Earth to do. Jesus never let approval or rejection of others control him. It’s part of the reason he lived without stress. In fact, Jesus reminds us in Luke 16:13, “No one can serve two masters” (NLT). You can’t live for the approval of others and live for God’s approval at the same time. How have you seen misplaced motivations cause stress to people you care about? What are some misplaced motivations that have caused you stress? What kind of practical reminder can help you remember your primary motivation?